As Woody Harrelson rolled his penalty into the net in the Socceraid match last night, once again, England had lost on penalties. 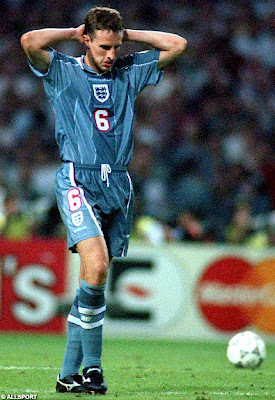 The most unsuccessful major international side in history in shootouts, England have a 17% winning record, winning only 1 against Spain in 1996, whilst losing 5 since the heartbreaking defeat in Turin in 1990. So why are England so bad at penalties, and can they improve? Critics often claim that the penalty shootout is a terrible method of determining matches – a complete lottery. However, can it really be a complete lottery? If it is, why do England seemingly lose every time, whilst the Germans seem to be masters at it. The reality is that it is anything but a random lottery. Research and game theory can be used to provide that all-important edge in the shootout, and whilst the pressure can affect even the best-laid plans, any advantage, no matter how small, could be vital. The obvious first step would simply be to practice penalties in training before the tournament. However, as blindingly clear as this may be, Glenn Hoddle admitted following England’s defeat to Argentina on penalties in 1998, that they had not practised penalties at all beforehand. Frankly, this seems quite bizarre. Although you clearly cannot replicate the pressure in training sessions, it would surely provide the experience that may help. 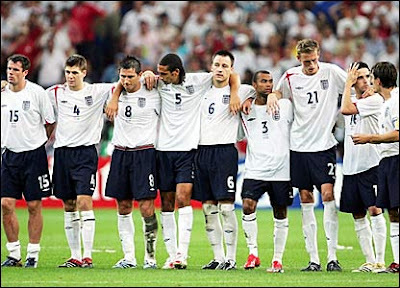 Following England U21 losing to Holland on penalties in 2007, Stuart Pearce had the team practising penalties in every training session for the two years ahead of the 2009 tournament. Not only did this provide the practise for the players, it meant that he knew exactly who the best penalty-takers were. Hence, Joe Hart stepped up to take the second penalty against Sweden in the semi-finals. England went on to win the shootout. Next, it always seems to be the case that managers leave it up to the players to decide who is confident of taking a penalty kick. Whilst confidence in yourself is an admirable trait, it seems ridiculous that you may have players taking their first ever penalty as a professional in such a high-pressure, high-stakes environment. Both in 1998 and 2006, David Batty and Jamie Carragher respectively were taking their first ever penalties as a professional. They both missed. Come South Africa, England will have plenty of players that are regular penalty-takers for their clubs – Frank Lampard, Steven Gerrard, James Milner, Wayne Rooney and Gareth Barry all take penalties on a regular basis. If we reach a shootout, the majority of those should be on the pitch, and you would expect them to be the first-choice takers. If we add Ashley Cole and, potentially Joe Hart, there are plenty of quality takers there to avoid the situation of inexperienced players taking penalties. However, there is plenty of research has been done on penalties by academics and people involved in the sport alike. Two recent examples suggest how effective prior research can be in influencing the outcome of shootouts. Firstly, there was Jens Lehmann for the Germans against Argentina in 2006. Ahead of each penalty, Lehmann would take a scrap of paper out of his sock, study it, then prepare to face the penalty. At the time, commentators suggested it was a poem or a prayer – instead, it was actually a list of instructions of where the Argentineans were going to put their penalty kicks. He had notes on 7 different Argentinean players’ penalty techniques. Whilst only 2 ended up taking the kicks, his notes were correct on each. Before the tournament, the Germans had built up a database of over 13,000 penalty kicks, providing invaluable information on each player. His notes on Maxi Rodriguez suggested that the penalty would be hit to the left. He went that way, but unfortunately the penalty was hit too well. However, the notes on Ayala said ‘waits long time, long run-up, right’. After a long wait and run-up, Ayala hit the penalty right, and Lehmann saved it. Despite not having notes on Cambiasso, simply studying the scrap of paper intently gave him the psychological edge, and he saved it to send the Germans through. The other example was the 2008 Champions League Final between Manchester United and Chelsea. Ahead of the game, Chelsea were provided with information about the United penalty tactics. Edwin Van der Sar favoured diving toward the taker’s natural side. Therefore, right-footed Chelsea players would have a better chance of scoring if they shot to their unnatural side, i.e. to VDS’s left. Furthermore, they should either hit it low along the floor, or high, since the majority of VDS’s saves were at a height of between 1m and 1.5m. Finally, against Cristiano Ronaldo, it was crucial for Petr Cech not to move early, since Ronaldo would change his direction, and that if he pauses, he almost always goes to the keeper’s right. Armed with this information, Chelsea went into the shootout. Michael Ballack’s penalty went high to VDS’s left, Juliano Belletti went low to VDS’s left. Both scored. Petr Cech remained dead-still during Ronaldo’s run-up, Ronaldo paused, then put his penalty to the right. Cech saved it. The next four penalties – Lampard, Cole, Terry and Kalou – all went to VDS’s left. Ashley Cole being left-footed, disregarded the advice, and his penalty was almost saved. Then, ahead of Nicholas Anelka’s crucial penalty, Van der Sar seemed to have cottoned onto the tactic. However, he believed that they were all going left, rather than just the right-footed players. He pointed to his left-hand corner, trying to psyche-out Anelka. It succeeded. Anelka changed his mind, hitting the penalty at a mid-height to VDS’s right. It was saved and Manchester United had won the shootout. Clearly, the research cannot guarantee a victory, but it provides the extra tiny edge that can be the difference. Various other statistics are interesting regarding penalty shootouts. If you have the option, going first is beneficial. The team going first wins around 60% of penalty shootouts, presumably due to the fact that there is less pressure on them. Attackers score the highest percentage of their penalties, followed by midfielders, then defenders. This makes sense, and although there are always going to be exceptions, the more attacking the player, the more likely they are to score their penalty. Thus, a team should avoid letting defenders take crucial penalties. Memories of key penalty misses in recent times, include the likes of Gareth Southgate, Jamie Carragher, John Terry, David Batty, etc. Players that have been on the pitch for less than 30 minutes score on average 86.7% of successful penalties, compared with 81.9% for those who have played between 31 and 90 minutes, and 80% for those who have played more than 90 minutes. The fresher the player is, the more likely he is to score. Finally, the younger players tend to score more often. Players under 22 score 85.2% of penalties, compared with 77.6% for 23-28 year olds, and 78.1% of over 29 year olds. Whether the pressure gets to younger players less is debatable, but they do seem to score more regularly. So, preparation is key when it comes to giving the side the best chance of winning a penalty shootout. So let us hope that Fabio Capello has had the team practising regularly, and they have done their research on potential opposition. However, a final statistic to give us hope – in the last 5 years, the keeper with the lowest percentage of penalties scored against him is Rob Green. Only 53% of penalties in that period have been scored against him.